Bloomington-Normal youth paint a mural last summer as part of an Illinois Art Station led project along the Constitution Trail. It was one word. But that was enough. Early Learning Center in Bloomington. The Autism Place (TAP) was holding its half-day program for preschoolers and hosting two educators from the Illinois Art Station (IAS) through a collaboration between the two Illinois State University-affiliated organizations. One of those instructors was Mary Smyers, a graduate student in speech-language pathology. She placed a paper plate with two separate globs of red and white paint on a table in front of a girl wearing pink-rimmed glasses. A few minutes earlier, the girl had been spinning around the classroom while a TAP teacher gently encouraged her to participate in reading time. Now she sat still and stared at the plate. Smyers rolled a small toy truck over the paint, mixing the two colors. That brief response was enough to satisfy TAP Director Karla Doepke. The girl rarely spoke, and lessons for young children with autism should encourage them to engage and communicate, said Doepke, who is also an associate professor of psychology. The IAS art educators had been accomplishing that mission since the weekly art segments began earlier in the month, by getting the students to participate in a range of art activities such as creating dinosaur egg sculptures and painting masks. “The (arts program) gives them another avenue to express themselves,” Doepke said. The TAP class is just one of many partnerships IAS has forged in the past year as the innovative program takes root at Illinois State University and reaches out to children and youth in the surrounding community. The organization is the brainchild of Distinguished Professor Emerita of Psychology Laura Berk. She has provided the startup funding for IAS since its inception in 2016. 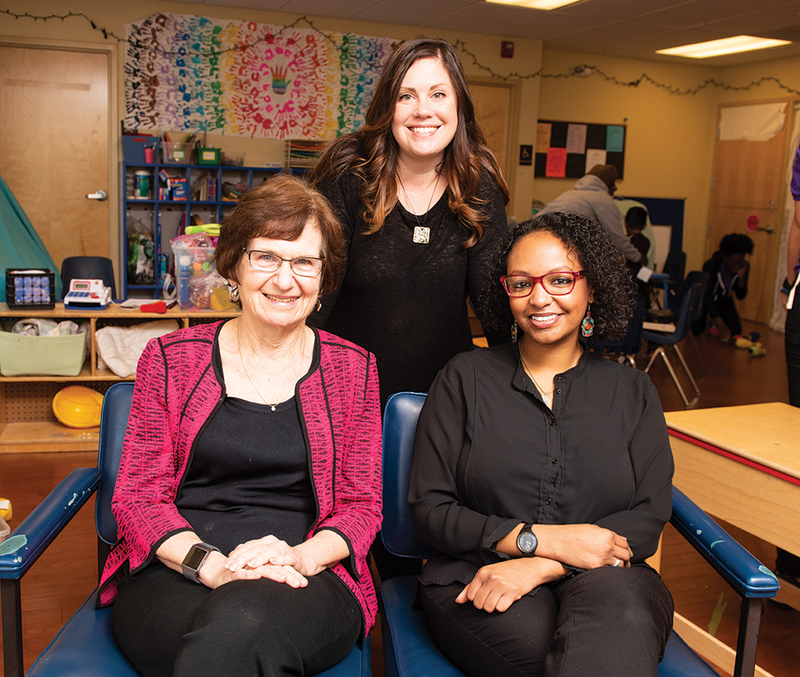 Berk had conducted groundbreaking research on the importance of play in childhood and wanted to create a space that fused the visual arts with child development. IAS is modeling itself on established programs like the Children’s Museum of Arts in New York and the Bronzeville Children’s Museum on Chicago’s South Side. “My goals are to capitalize on the unique power of the visual arts to reach and inspire our children and youth in all their diversity and to deepen their understanding of themselves, their community, and their wider world,” Berk said. IAS has hired Isra El-beshir as director. El-beshir previously served as the curator of education and public programming at the Arab American National Museum, a Smithsonian affiliate. She said IAS is offering an exciting perspective that is missing in McLean County. IAS will be the first in McLean County to offer children and youth ages 18 and under a hands-on, interdisciplinary visual arts experience that is informed by pedagogy and scholarship for both Illinois State and the broader community. At this point, the Illinois Art Station is still evolving into its name. The organization’s two administrators—El-beshir and Curator of Education Peggy Finnegan-Boyes, M.S. ’08, along with four graduate students and one intern—operate out of temporary headquarters in Williams Hall. The art educators travel from IAS workshops in a university-issued van brightly painted and branded with the organization’s name. For now, IAS has been holding free children and youth art workshops in collaboration with various community partners, such as TAP, the Bloomington and Normal Public Libraries, the Western Avenue Community Center, and the Boys and Girls Club of Bloomington-Normal. For IAS to fully realize its mission and vision, it needs its own space, El-beshir said. The organization is working to secure a 10,000-square-foot facility within a 10-minute walk of Illinois State’s campus. There, IAS would continue to expand its community partnerships, and also offer studio art classes, exhibit artwork, and become an innovative space for immersive learning in the visual arts. “It’s going to be a really good think tank for people across campus who are interested in the development and welfare of children,” said Judith Briggs, an IAS Advisory Council member and an associate professor of art education. El-beshir envisions a space where artists would lead classes involving all of the visual arts, may they be animation, ceramics, filmmaking, or painting. IAS classes would also go a step further by making concerted efforts to reach underserved populations, providing scholarships and tuition assistance, addressing social issues in the community, and taking a multi-subject approach that enables children and youth to mix arts with the STEM disciplines. “Our mission is to provide all children, youth, and their families with transformative experiences of visual arts. We want to leverage our mission and provide a space that aims to educate, inspire, and challenge,” El-beshir said. An early highlight of the Art Station’s programming, which began last summer, was a mural project for the City of Bloomington Citizens’ Beautification Committee. Over the course of three days, 12 junior high and high school students worked alongside artist and Illinois State graduate Jeremy Langston, M.F.A. ’18, to paint a mural along the length of the Constitution Trail underpass below Washington Street. IAS has also partnered with Illinois State’s First Star Academy, which prepares foster youth for college. Twenty high school students participated in an IAS printmaking workshop, then exhibited their artwork at Illinois State’s Transpace gallery. The Illinois Art Station is also providing community engagement opportunities and real-world teaching experiences to Illinois State students employed as graduate assistants. Besides Smyers, there are two students from art education and one from the Arts Technology Program. Finnegan-Boyes develops the workshops and trains the students on how to teach the materials and interact with the children at different stages of development. She pairs students from different majors in order to foster learning, not just for community youth but also for Illinois State students. For example, Smyers taught the TAP class with Brooke Ball, an art education master’s student. Finnegan-Boyes learned how to create interdisciplinary curriculum while teaching art for eight years at Metcalf School. “We are trying to be interdisciplinary so the ISU students can learn from each other and make the experience better for the community youth,” she said. 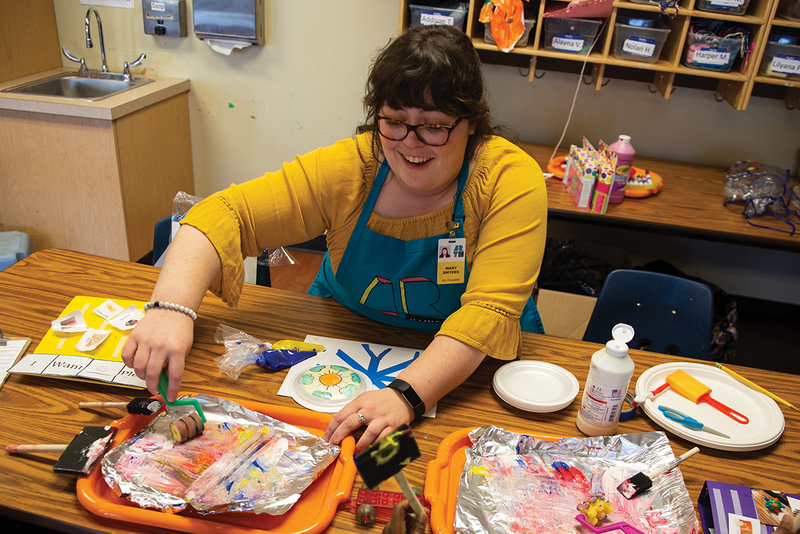 Mary Smyers is one of the Illinois State graduate students instructing children and youth in the visual arts as part of the new Illinois Art Station. Smyers said she was thinking of the sensory needs of the students when leading activities in the TAP class. She and Ball encouraged the preschoolers to get their hands messy and play with the paint. The instructors are not trying to create mini-Picassos; instead, they are offering the children the opportunity to learn about different art media and create their own work. Ball has learned a lot about working with children with autism while teaching with Smyers and also how to develop a dialogue with fellow teachers, community organizations, and students through the classes she has taught for IAS. As Illinois Art Station finds its place in Bloomington-Normal, innovative arts programming for children and youth will become ubiquitous as well. Isra El-beshir at imelbes@IllinoisState.edu or (309) 438-0862. Follow Illinois Art Station Facebook, Instagram, and Twitter. Deborah Fox, the College of Arts and Sciences’ assistant dean for external relations, contributed to this story.